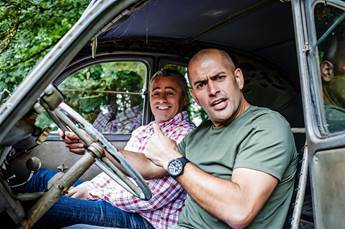 Watch episode 4 of Top Gear Series 25 on Wednesday 21st March, from 8pm on BBC Brit (DStv Channel 120) where Matt LeBlanc, Rory Reid and Chris Harris explore the fast and the retro of motor vehicles. Matt tests the world's fastest-accelerating car, with a little help from NASA, while Chris pens a heartfelt love letter to the Citroen 2CV – which is the Frenchiest of old French cars around. Don’t miss the hilarious segment where Matt and Chris find themselves in quite an ‘eggy’ situation, if that’s not enough they’ve thrown in a few sheep for some added entertainment. Confused much? You’ll have to tune in to experience all the silliness. Rory samples some exciting cars from South Korea to see if, in fact, they can measure up to the European big boys and whether or not the Kia Stinger and Hyundai i30N can make it to the Top Gear International League Table Of Countries That Make The Fastest Cars, or the TGILTOCTMTFC for short. In this week’s episode, Irish comediennes Dara Ó Briain (presenter of BBC BRIT’s Robot Wars) and Ed Byrne (stars in BBC BRIT’s Live At The Apollo) join the team in-studio and there are bound to be quite a few laughs in store with this combination. Ep 4 fun facts: The Citroen 2CV featured in the episode actually belongs to Chris. 540 Eggs were used during this insert and it took six people two hours to clean out the 2CV after the eggs cracked. The two sheep used in the film was professionally trained and vetted for film and TV production. It took 5 members of the production team, 2 carpenters, and a cherry picker to construct the lap board used in the episode to test out the Kia Stinger and the Hyundai i30N. For a teaser of what to expect from episode 4 here. Follow www.topgear.com for all the details. Top Gear Series 25 sees Matt LeBlanc (best known for his role as Joey Tribbiani on the iconic NBC series Friends), Chris Harris (former professional race car driver), Rory Reid (award-winning motoring journalist) and The Stig return to your screens, with guest appearances from Sabine Schmitz and Eddie Jordan. During six hour-long episodes, watch the team tackling the big issues: building the world’s fastest tractor, tackling America’s Wild West in shiny new V8 sports cars, attempting to land a NASA research plane in America’s ultimate muscle car, and much more. Season 25 was filmed in locations including Japan, USA, Portugal, Italy and just outside of Guildford. As BBC Worldwide’s most popular show in South Africa – fans can expect the latest season to deliver Top Gear’s trademark array of stunning photography, state-of-the-art supercars, and celebrity guests. If you love Cars the this is the show for you which will keep you glued to your seat but do fasten the seat belt.